The most powerful evidence, which convinces my consciousness that the universe exists, is that it appears to contain objects, such as the statuette on the right. Any given object seems to me to have its being as a piece of tangible matter (or material) located at a particular distance and direction from the location and axis of a mysterious portal through which my conscious mind is aff­orded its sensory perception of the universe. As a conscious ob­server, I am just another object within the universe. My positional and temporal status is no more or less significant than those of any other object. I am thus only able to view the universe from the one particular place where I am at one particular time. Its geometry fundamentally prohibits me from viewing it from all points within it at all times. Thus, my view of the universe must always be relativistic: it can never be absolute. 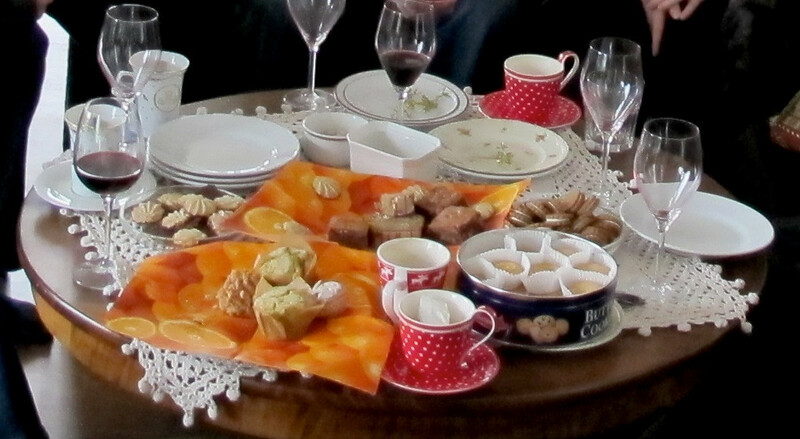 I perceive objects to have different shapes, sizes, colours, textures, densities and other characteristics like the variety of objects of food, glass and crockery on the coffee table shown on the left. Although familiar objects usually rest upon the ground or a table, they exist separately from and independently of the ground, the table and each other. Zooming outwards from the coffee table, I perceive a group of objects called human beings or people. These objects all share a far more complex set of characteristics. By far their most dominant characteristic is that they are sentient beings. Each one is consciously aware of his own existence. Be­ing separate objects, each necessarily occu­pies a different position in time and space. This constrains each to perceive the univer­se from a different point of view. Here, I am referring strictly to a physical point of view, which is guaranteed by the fact that no two people can be in exactly the same position in space at exactly the same time. 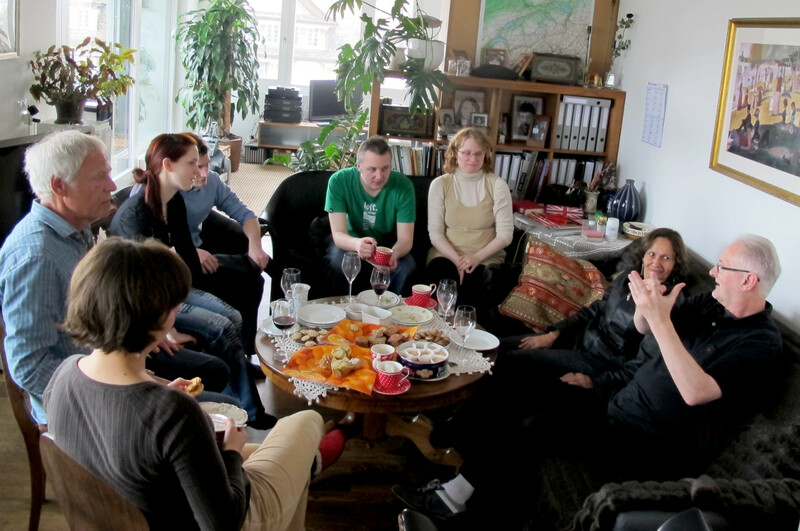 The people shown sitting around the coffee table comprise 1 Brazilian, 3 British, 1 German, 2 Hungarian and 1 Romanian. Consequently, their cultural points of view may be quite diverse. They also comprise a Judicial Analyst, a Human Eco­logist, a retiree, an unemployed, a software salesman, an airline pilot and two university students. Consequently, their sociological and intellectual points of view may also be very different. But these points of view are from widely different loca­tions in a multi-dimensional semantic space: not physical space. If we zoom out to the scale of a city of 380,000 people, the difference between the physical points of view of the people sitting round the coffee table is very small. 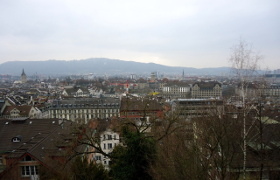 They all essentially view the city from the same co-ordinates in space and time. Some objects can be composite. They are made up of many smaller objects. The city is obviously a composite object made up of buildings, roads and lots of other things. It is difficult to think of the city and its hinterland as a separately demarcatable object. 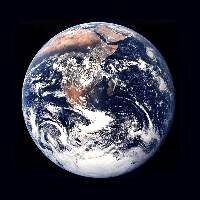 This is because it is really only a small part of a much larger object, namely, Planet Earth. The Earth is a well demarcated object. It is joined to nothing. It is alone in space. It is an isolated object within the universe. However, the universe is so vast that, although there are 7 billion people spread out around a planet with a circum­ference of 40,030 km, it is as if all the people on it view the universe from exactly the same point in space and time. But the Earth is not the only object in the universe. It contains countless objects. 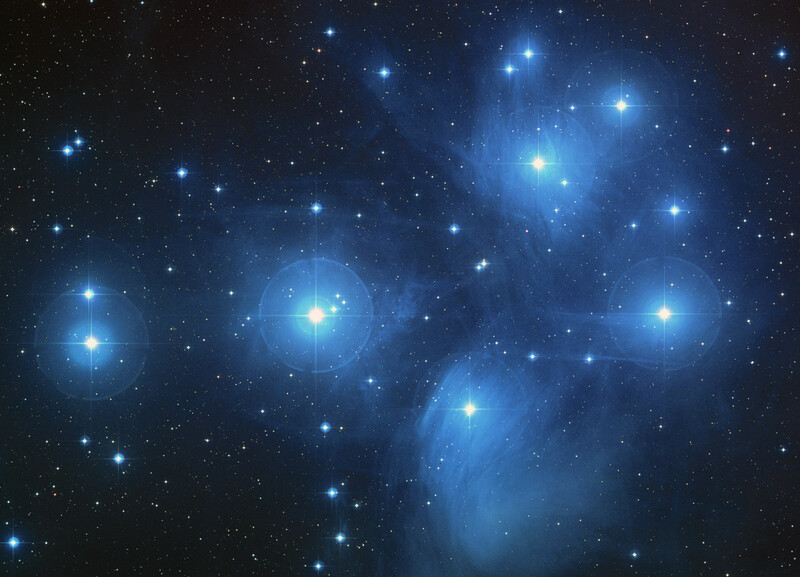 We can easily see many that emit light, like the stars of the Pleiades shown on the left. There are also many others which don't emit light. Every object that I see, such as a Pleiadean star, is something which the mechanisms of perception within my mind can distinguish and recognize as something separate from the rest of the universe. But is it truly separate? The fact that I (an object in the universe) have sensual awareness of the Pleiadean star (a different object in the universe at a great distance from me) persuades me that I must, in some kind of way, be connected to it. Thus, in general, I surmise that no object is an island. All objects are connected parts of a single universe. They are simply those parts of the universe where the universe's essence is more concentr­ated. The only truly isolated object is the universe itself. It is clear and obvious that the city is composed of smaller component objects such as houses, buildings, bridges and roads. Within and upon these walk smaller objects called people. However, on looking more closely, it is clear that the human body is also composed of smaller component objects called organs. The organs are made up of cells. Cells are too small to see with the naked eye. Only a powerful micro­scope can make them visible. Cells are considered to be the smallest components of objects that are considered to be living. Cells are composed of smaller constituent objects called molecules, one of the largest of which is the DNA molecule. A symbolic representation of the DNA molecule is shown on the right. The structures of molecules can only be made visible by instruments like the electron microscope. Inan­imate objects like rocks are also made up of molecules. Some rocks con­tain chunks of material called crystals. A pure crystal could be considered to be a single molecule of a size which is well visible to the naked eye. Molecules are themselves composed of even smaller objects called atoms. 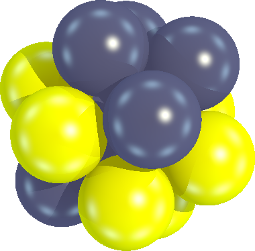 There are 80 stable types of atom (elements). This excludes two (shown in grey) that were discovered to have a barely perceptible instability. These 80 different types form a kit of building bricks from which all molecules - and hence all objects - are constr­ucted. Almost all of life (96%) is made of just the 4 elements shown in strong green below. 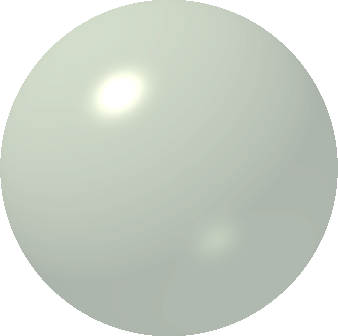 A further 3½% of life is made up of the further 6 elements shown in the weaker green. The remaining ½% of the substances of life are made up of a further 13 of the remaining stable elements. In addition to the 80 stable elements, a further 18 unstable (radio-active) elements occur naturally. Over millions of years, these gradually disintegrate into lighter ele­ments. A further 21 elements have been created artificially, many of which are so unstable they can only hold together for a matter of tens to hundreds of micro­seconds. So they are no use for constructing molecules, let alone anything larger. They are created simply to investigate the nature of atomic structures. Even atoms - the elemental building bricks of everything - are made up of components which are even more elementary. These are known as sub-atomic particles. 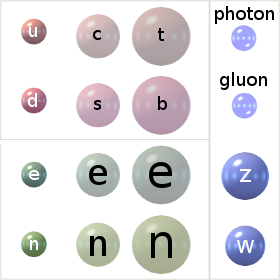 As the name particle implies, they are perceived by sci­entists as separate objects in space. At the time of writing, as far as I am able to under­stand it, there only appear to be 16 differ­ent types of sub-atomic objects, although 12 of them are thought to have correspo­nding anti-types, bringing the total to 28. It is thought that if a type and its anti-type collide, they annihilate each other. Each of the 4 types shown in blue is consid­ered to be both a type and its anti-type combined. Of the first 3 types shown on each row of the above table, the 2 larger ones can be thought of as transient states of the first. Thus, although these 3 particles are perceived by observers as separate types of sub-atomic object, they are simply the same type in 3 different states of being. But how valid is the popular perception of these sub-atomic things as particles: sep­arate self-contained objects moving around in empty space? Human perception is extremely fallible. However, at such a microscopic scale, this fallibility of perception is rendered even more fallible by fundamental constraints, which inevitably exist within whatever physical channel may be used to observe them. The idea of these sub-atomic objects being like little billiard balls, darting around in all directions colliding with each other, does not rest easily with my inherent con­ception of physical reality. I perceive these sub-atomic objects as somehow being tenuously joined together to form a kind of mottled continuum. I think my idea is consistent with the view that all space is pervaded by a matrix of force-fields within which all sub-atomic particles are merely disturbances or centres of stress within the various kinds of force-field of which the matrix is composed. The problem with the idea of force-fields is that the term itself is conceptually erroneous. They are fields of something. Against this I have no argument. However, they do not, of themselves, exert any external forces on anything. For instance, a gravitational force-field does not exert an external force upon a falling body, in spite of the fact that, from some observer's frame of reference, that body may appear to be accelerating. A falling body is in neutral equilibrium. It is only when the body rests on the ground that the ground itself exerts an upward external force upon it. The same is true of sub-atomic particles within so-called electro-magnetic and nuclear force-fields. My own view is somewhat different from that of mainstream science. It is founded upon the notion that, since the universe is, by definition, a single communicative system, all its parts (or features) must be connected together by something. Con­sequently I propose that what science currently perceives as a force-field is really a vectored flow of that something, which I envisage as a kind of universal essence or æther. Any object in space - whether stationary, moving at constant velocity or accelerating, however non-linearly, relative to any particular frame of ref­erence - is at rest with respect to the æther provided it is not being acted upon by any directed external force. Trapped in our terrestrial environment, the notion that an object, with no external force acting upon it, can be in a state of acceleration relative to a particular frame of reference, can seem somewhat counter-intuitive. Notwithstanding, imagine two ball bearings (spheres of steel) free-wheeling in space. They have no rocket motors or any other kind of propulsion device pushing them. They are approaching each other. However, they are not on a collision course with each other. They will pass each other at a minimum but finite distance. Then they will go on their ways rece­ding from each other. Their mutual relative velocity follows a sigmoid curve, which is substantially non-linear. Even their relative acceleration is non-linear. So the appli­cation of a directed external force to a body in free space is not essential for it to be in a state of acceleration relative to an arbitrary observer. Thus the flow of the æther is a universal datum. When you "go with the flow", you are at rest, even though you may have a relative velocity - or even an acceleration - relative to other things that are also "going with the flow". This is because the æther itself is a non-uniform essence in non-uniform motion. Like a so-called force-field, an æthereal flow-field does not pro-actively exert a force on anything. A force is only necessary to move [an object] against an æthereal flow. I should therefore prefer that what science currently refers to as force-fields were called flow-fields. Thus, mapping current mainstream thinking, there would be a gravitational flow-field, an electromagnetic flow-field, a strong nuclear flow-field and a weak nuclear flow-field. However, I speculate that there is need for only one flow-field. In other words, the essence of the universe is a single æthereal flow-field, which in some places flows radially (convergently) while in others it also has (at least in part) a rotational or vortexial component of flow (a curl). There are 3 independent directions in space. These give rise also to 3 mutually in­dependent axes of rotation. This results in 6 independent degrees of freedom for the flow of the æther. Any particular standing-wave structure [object] will thus app­ear to an observer to involve between 4 and 6 different kinds of flow-field, de­pending on the precise direction from where he is observing it. Thus, what appears to science as a plurality of fundamental force-fields would merely be manifestations of the single æther, in different modes of flow, as seen from different angles. Un­fortunately, an observer, whose view is constrained to be from only one single point in time and space (as is the case for all human observers), is fundamentally un­equipped to probe any deeper. He can only ever arrive at the single æthereal flow-field (if it indeed exists) through deductive speculation. The human being is a mere sub-system of the terrestrial biosphere. Consequently, the neural networks of the human brain are configured to be able to recognise and respond to events that take place within the terrestrial environment. The basic parameters by which the terrestrial environment, by its physical nature, lends itself to be measured are distance and time. Added to these, we need one more dim­ension of measurement to enable us to get a handle on the notion of objects. That is mass. Thus, because it is necessarily based on fundamental notions derived from the terrestrial environment, human science has, as its fundamental concepts of measurement, a measuring system based on Length, Mass and Time, which is un­surprisingly known as the LMT system. Unfortunately, from the point of view of understanding the universe in general, the terrestrial environment is only a very limited special case of physical reality. Part­icularly, the human notion of distance (or length), which is glaringly based on the planetary surface, is only a very special case of what we perceive as relative velo­city. It is the special case where relative velocity happens to be zero, which is an arbitrary point between approaching something and receding from it. If we wish to gain a more fundamental view of physical reality, we should use the most funda­mental possible measures. Therefore, rather than express velocity as V=LT-1 [length per unit time or metres per second], we should rather express the special case of distance (or length) as L=VT [unit velocity intervals or knot-seconds]. Here I have taken licence by using the word knot as a single-concept unit of velocity, which in this case is not the usual nautical mile per hour but a metre per second. Of course, there are other units of measure which, as Earth-bound creatures, we consider fundamental, but which are not. These should also be re-expressed to give us a set of truly universal dimensions in terms of which to view the universe. I am sure that an appropriate change in the fundamental parameters of scientific meas­urement could make observed phenomena much easier to understand conceptually without having to resort to our present bizarre counter-intuitive views of the sub-atomic and the super-galactic. Notwithstanding, even velocity is not a fundamental measure. It is but a special case of first-order acceleration, A, such that A=VT-1=LT-2. Likewise, first-order accel­eration is merely a special case of second-order acceleration, and so on. Even the close encounter of the two ball bearings in space involves extremely non-linear acceleration. So where is the basis? What is the final order of acceleration? There isn't one. The relative motion between the two free-wheeling ball bearings, during their close encounter in space, involves infinite orders of acceleration. Such irrationality, rather than suggesting that the universe be incomprehensibly complicated, indicates to me that I, as a relativistic observer, must be viewing the situation from a very awkward and disadvantageous angle. I need to move to a different conceptual viewing point. For this, I would like to go back to the statement through which I defined what I mean by the universal æther. Any object in space ... is at rest with respect to the æther provided it is not being acted upon by any directed external force. The application of a directed external force to a body in space causes it to move relative to (against the flow of) the æther. So a better way of viewing the motion of a body in space may be to measure the difference in its motion between when it is, and when it is not, being acted upon by a directed external force. This is a measure of the body's motion relative to the æther: not to other bodies moving freely in space. The units of this measurement are clearly the units of force. This makes force the most fundamental measure. It is also an absolute measure. An amount of applied force pertains only to the body itself and is not relative to any other separate and independent bodies in space. Notwithstanding, it is first necessary to qualify exactly what I do mean and do not mean by the term force. The formula on the right gives the so-called force of attraction F between two bodies of masses M1 and M2 a distance r apart in space. It always gives the right answer to an accuracy sufficient for navigating space probes to the furthest reaches of the solar system. Notwithstanding, whatever it may be, F isn't a force. The two bodies concerned fall towards each other at a highly non-linear rate of acceleration. But no directed external force is acting upon the surface of either of them. Consequently, both bodies are at rest with respect to the æther. From this it is clear that most bodies in the universe are ostensibly at rest with respect to the æther, even though they may have very complex - often highly non-linear - motions relative to each other. The mathematics, within which the gravitational formula above is embedded, forms a cogent structure which agrees, to a superlative accur­acy, with physical reality. But it does so through erroneous reasoning. To calculate physical reality, one may use whatever works: but to understand physical reality one must perceive only what is really there. There is no force of attraction between the two bodies. So we should not perceive one, even if everything works out right when we do so. If the two bodies are falling towards each other while "going with the flow" of the æther, it appears that the æther is flowing smoothly into each of them, like a 3-dimensional ver­sion of the surface of the whirlpool shown on the left. It is as if each object in space is covering a sink-hole into another dimension, into which the æther is continually draining out of the part of the universe which we can experience into a part of the universe which we can't. Notwithstanding, the relative velocities of celestial bodies are not consistent with what they would be if they were all flowing along the surfaces of whirlpools. So the æther is not like a physical fluid. The nearest way I can describe its nature is as that of, what I would call, a time-differentiated fluid. This means that the rate at which the æther is flowing into each body depends on their original relative velocity when they were essentially beyond each others "gravitational" influence. In other words, the æther is an essence that is one order of time differentiation removed from the notion of a flowing fluid. And any vortexial (rotational or orbital) twisting is a func­tion of the two bodies' original relative velocity and collision course off-set. The æther could continually accumulate at the centre of each body. The problem with this idea is that the fundamental particles of mat­ter would have to grow in size, density or both, which they don't appear to do. The æther itself, being a time-differentiated fluid, can have no sta­tionary existence. As it flows into a point singularity, at the centre of each fundamental particle, it comes to a stop and so necessarily ceases to exist. The æther could continually flow into the centre of a fundamental particle, where it is converted into an inverted form, which flows out­wards again into space. 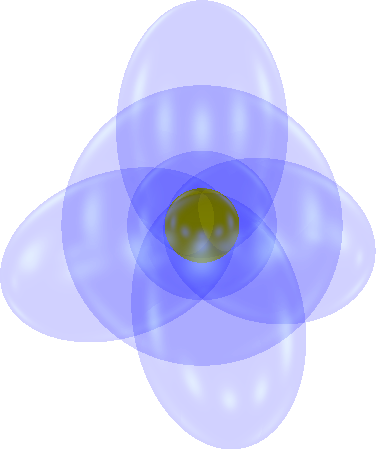 The inverted form does not interact with material objects. The æther could continually flow, through a sink-hole at the centre of each fundamental particle, out of the dimensions of the space that we know into the dimensions of a hyperspace that we don't. Perhaps we exist in that hyperspace but are equipped to have awareness only of the space that we know. I am open-minded about these four possibilities. However, I think, on balance, that I would opt for the fourth. Perhaps there is a better one I have not thought of. But why would such singularities exist? What causes such an æther-sink to form? And why should the æther want to flow into it? I don't know. Perhaps an evenly distributed æther would be inherently unstable, like an upside down pyramid. Any slight irregularity or perturbation would cause the æther to gravitate into an intensifying vortex, which would become stable only after it formed a sink-hole singularity at its centre. I imagine the process as somewhat analogous to the way the wind swirls the clouds into an ever-intensifying tornado until it reaches down to the ground. On the other hand, perhaps enormous pressure or energy-density, provided by some external agency, creates a sink-hole by snagging the æther into a permanent knot. So perhaps a sink-hole could be thought of as a small sphere of crimped space. Personally, I have an aversion to the notion of singularities. For me, they don't sit well with the observed nature of things. I think that, at least in general, nature avoids them by imposing strong non-linearities in places where singularities would otherwise form. So I think of a sink-hole as a sphere of crimped space, with a small finite radius. In all four cases above, the æther appears to flow into such a sink-hole at the centre of each particle of matter. From this, it is only a small step to imagine the "body" of the particle itself as simply a kind of æthereal backwash from the in-flow, analogous to standing waves in an RF transmission line. This standing-wave back­wash is a protective buffer which, in general, stops adjacent centres of in-flow from merging, thus preserving the integrity of the particle. The æther is a kind of fluid pouring continually into the centres of particles of matter. Yet material objects, free-wheeling in space, do not flow through the æther: they flow with the æther, even though the objects, between themselves, can have quite complex relative motions. Thus, the universe, within which we freely move, is analogous to the surface of the whirlpool in the pond shown above. However, it is vital to maintain acute awareness that the universe is 3-dimensional: not 2-dimensional as in the case of the pond with the whirlpool. It is unfortunate that science invariably represents a 3-dimensional vortex, such as what they call a gravitational field around a star or planet, by means of a 2-dimensional illustration like the one shown on the right. I don't like this 2-dimensional analogy. It relies on the water being "pulled" downwards by a uniform gravitational field. Thus it represents a non-linear gravitational field by a linear one. It is merely a geometrical transformation. It represents gravity in terms of itself, which doesn't explain anything. 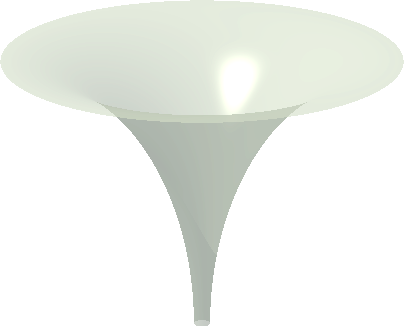 I therefore like to imagine an æthereal vortex as a symmet­rical radial flow of æther towards the centre of a sphere, at which the æthereal sink-hole is located. Perfect radially-symmetrical in-flow is something I find difficult to envisage because it would cause the æther to converge to a single point, at which it would achieve infinite density. To avoid such a point-singularity, nature could impose an upper limit on æthereal density. This would result in an æthereal backwash, which would effect­ively give substance to the material particle. The backwash could be static and smooth effectively creating a static æthereal atmosphere around the sink-hole. Thus is formed a small neutral inert fuzzy particle. The backwash could also be oscillatory - waxing and waning spherically like a 3 dim­ensional version of an ocean tide. This would give rise to a similar small neutral inert fuzzy particle but with oscillating size and density. The smooth and oscillating ver­sions could be compared to emptying a bottle of water. The first is where a gap is maintained above the water as it passes through the neck of the bottle, thus allow­ing smooth flow. The second is where the bottle is tipped further, closing the air gap so that the passage of the water through the neck of the bottle becomes oscillatory. Oscillation of æthereal density need not be necessarily radially-symmetrical. 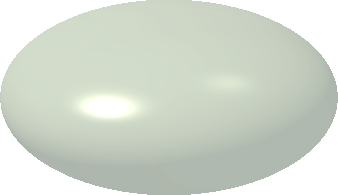 The mode of oscillation could, for example, comprise a periodic change in the shape of the close-quarters æthereal density contour between the oblate ellipsoid shown on the right and the prolate ellipsoid shown on the left. The geometry of space would allow the æthereal density contour, in the hinterspace of a sink-hole, to take on many other possible modes of non-rotational oscillation. 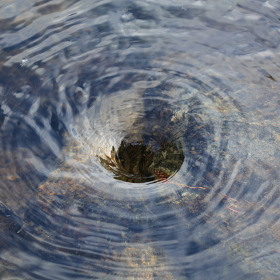 The slightest irregularity in radial flow could set the sink­hole rotating. 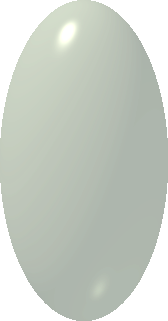 A low spin rate would cause the æthereal density contour to become and remain oblate, as shown above on the right. Increasing the spin rate would cause the profile to cusp in the centre to form a torus. Initially, the torus's minor radius would be greater than its major radius, as shown above on the right. Increasing the spin rate further would cause the situation to rever­se, with the major radius becoming greater than the minor radius, as shown on the left. These various surfaces represent the ways in which the æther could pour and swirl, 3-dimensionally, into a central sink hole. However, the fundamental particles, for­med from the æthereal backwash, would all be necessarily inert or neutral. They would have no means of connecting with each other to form larger structures. By analogy with chemistry, they have zero valency. They may be very effective æther sinks, thus appearing to exert what we perceive as gravity; but that is all they can do. In other words, they exhibit the character of neutral (uncharged) particles, some of which may constitute what is generally perceived as Dark Matter, which is currently thought to make up the majority of the matter in the universe. Such particles may permeate all space and material, being the unseen providers of what science perceives as gravitational force, thus leaving the known charged particles of the Standard Model conveniently massless. I remain open as far as this idea is concerned. However, my preference leans more to the notion that the detectable primary particles are other forms of æthereal flow which have non-zero valencies. My notions of the various forms of æther-flow, as described above, do not define anything tangible. They are not objects that can be detected. They simply define the universal environment in which we - and all that we know - exist. In other words, they define the shape and motion of space and time. The detectable fundamental particles perceived by mainstream science are something else. My proposition is that the detectable fundamental particles must be objects of a seemingly different substance, which exist within - and are constrained by - the above described æther-flow framework. The key word is seemingly. My conjecture from the beginning has been that the universe is the æther. Consequently, all that is in the universe must have been fashioned by somehow bending, buckling or twisting the æther in certain places. This is undoubtedly how the sink-holes were formed. But we can't see them. They are fundamentally undetectable. So how were the detectable particles formed? And what makes their kinds of bendings, bucklings and twistings detectable? The æther, as I have so far explored it, has been a neutral essence. The connotation, implied by language, that positive be good and negative be bad is unhelpful in this context. For this reason, I think that, conceptually, the terms male and female would be more appropriate and semantically more accurate. Neverthe­less, since positive and negative are the terms of convention, I shall stick with them. While in combination in free space, the positive and negative components of the æther appear to be perfectly symmetrical. Notwithstanding, they have a subtle asy­mmetry, which only becomes apparent close to an æthereal sink-hole. And the way in which they are asymmetrical is to do with the purely geometrical asymmetry inherent to the sphere. Most people, at first sight, seem to think that the purest example of perfect symmetry is the sphere. Notwithstanding, the sphere is asym­metrical in that its inside is not symmetrical with its outside. Its surface contains a finite volume while its outside contains an infinite volume. The distance from its centre to its surface is finite. The distance beyond its surface is infinite. I suggest that the positive component of the æther and the negative component of the æther have the same asymmetrical relationship as do the inside and the outside of a sphere. Thus, far out in free space, where the curvature is negligible, their asy­mmetry is also negligible, and consequently the constituency of the æther is pretty well neutral. This is depicted on the right where yellow and blue represent the positive and negative components of the æther. Now let us continue on from the final case, discussed above, where the æthereal in-flow to a sink-hole is whirling round so fast that its major axis has become larger than its minor axis. Increasing the rotational speed of the æthereal flow even further should result in a flow profile like the one shown on the left. It reminds me of concept impressions I have seen depicting a cosmic rotating black hole with axial jets of matter and radiation. The æthereal sink-hole, in this case, is a fairly large circle. Most of the æthereal in-flow still goes down the sink-hole, so to speak. However, the high rate of rotation causes some of it to over-shoot the circular sink-hole to be jettisoned as a pair of opposing axial vortices, like microscopic æthereal tornadoes. I pro­pose that the extreme rate of rotation somehow splits the in-flowing neutral æther into its positive and negative components, ejecting them as separate coaxial layers within the axial jets. Alternatively, there could be a right-handedness and left-handedness, respectively, to the positive and negative components of the æther. If so, the positive component of the æther would emerge from one axial vortex while the negative component of the æther would emerge from the opposite axial vortex. 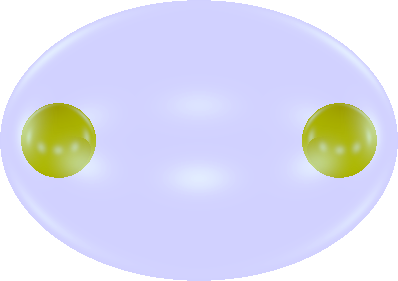 The spherical asymmetry, between the separated negative [−] and positive [+] components of the æther, flowing out of the axial vortices, causes them to form separate con­centric spheres around the sink-hole as shown on the right. The [−] component becomes sparser with increasing radius, until it merges into the neutral æther beyond. The [+] component becomes sparser with decreasing radius, until it merges again with the [−] component in order to be able to enter the ring-shaped sink-hole at the centre. The result is still a neutral particle. However, in this case, the particle's neutrality is no longer homogeneous. The positive and negative components of its æther have been spatially separated. But what maintains this separation? We are told that like charges repel each other. They want to separate. So no matter how finely you care to divide up the zone of positively charged æther, each little bit will repel every other little bit until it is all distributed evenly throughout the whole universe. The same, of course, applies to the zone of negatively charged æther. The answer is that the separation process is dynamic. Separation is taking place fast enough to maintain the concentric spheres of separately charged æther before they can diffuse or recombine (merge back) into neutral æther. The process could also be viewed as a phase-locked standing wave, which again, may be regarded as a dynamically-maintained structure. The double vortex, above left, may not be the mechanism by which the positive and negative components of the æther become dynamically separated. Perhaps various of the oscillatory modes mentioned earlier could cause the positive and negative components of the æther to become separated into concentric spheroidal zones. Whether or not the positive and negative components of the æther become dyn­amically separated may depend on something other than the mode of oscillation or spin of the æther-sink. It may depend on its size. In the previous essay titled The Enigmatic Æther, I spoke of all sink-holes as being identical standard units, and hence, all the same size. However, I was there referr­ing to what I saw as the basic or simplest form of sink-hole. But I see no reason why basic sink-holes should not merge. I surmise that there must be some kind of close-quarters mechanism that prevents them from merging spontaneously. But, under the great pressures extant within exploding stars, I think that sink-holes could be forced together to form composites. And these composites, due to their larger size, could give rise to all the complex standing wave structures that are possible within 3-dimensional convergent geometry. It is not now difficult to see that the concentric asymmetrical spheres shown above form the generic electrical profile of an atom. Such could form around the sink-hole within any of the æther-flow profiles described under the previous subtitle. Those profiles with a swirl or rotational component would cause the central positive sphere and the outer negative sphere to become ellipsoidal or possibly even toroidal. If, under stellar pressures, such atoms were crushed together to form composite structures, some of the generic components would retain their spherical shape, while some became elongated or lobed. Others could even become crushed to the point where their positive and negative spheres were forcibly latch-locked into isolated globules of neutral æther around a blocked sink-hole within the central positive sphere. Of course, around any of the myriad sink-holes in such a vast composite, the standing wave backwash of æthereal in-flow could appear as all things to all men, not only according to what is actually happening there but also according to the direction from which they are being observed at the time. The simple structure (in the last-but-one illustration) is electrically neutral. It seems, however, that it is not neutral in some other sense. Full neutrality is only attained when two such structures combine, as illustr­ated on the right. The two separate spheres of neg­ative æther flow combine into a single ellipsoidal lobe, which then envelops the two smaller spheres of posi­tive æther flow. Mainstream science perceives each of the two spheres of negative æther flow as a wave-particle called an electron. The electron, apparently, has a property called spin. Nature always strives to relax into a neutral state. 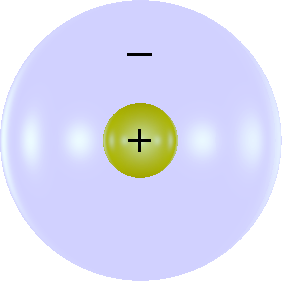 However, spin-neutrality can only be attained when two electrons, having opposite spins, combine into a single composite entity, namely an electron-pair, to form the ellipsoidal lobe as shown above. I have never been sure what they mean by "spin". It may simply be a label for a property, having no analogical relationship with the notion of anything spinning in the normal day-to-day sense. 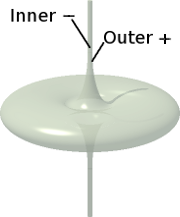 In my æther flow model, it could mean that the in-flow of æther into the two separate sink-holes must necessarily swirl in opposition. The fact that negative æther lobes need to pair-bond gives these electrically polar­ized structures (atoms) the property known as valency. The simplest structure has a valency of only one. It can connect with only one other structure. In the above illust­ration, two of the simplest structures (hydrogen atoms) couple together to form a two-atom (hydrogen molecule) structure. The larger "atoms" with more complex lobe structures can have valencies from 0 to 8. 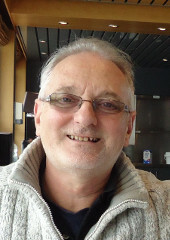 They can be inert (valency 0: they cannot connect with anything) to highly gregarious (valency 8: they can connect with up to 8 other objects). The idea of the æther swirling in opposite directions does not seem plausible as a reason for the higher valencies. I therefore conclude that all these valency links must be the result of satisfying a complicated dynamical standing wave structure of negative æther for stable harmonies of minimum energy. Or something like that. I postulated that these "atoms", as described above, form around sink-holes into which the neutral æther is continually flowing. But why should atoms form only within some of the sink-holes and not others? After all, the majority of the matter in the universe is thought to be dark - non-atomic. Perhaps a certain amount of vort­exial rotation is needed to separate the negative and positive components of the æther close to a sink-hole. Consequently, atoms won't form around sink-holes with pure radial flow or with too little vortexial flow. Perhaps only sink holes with a very flattened ellipsoidal or toroidal profile can catalyse atoms. Or maybe it is the other way around. I can only speculate. Mainstream science attempts to discover the internal constitution and structure of an atomic nucleus by bombarding it with smaller objects such as alpha particles. When a high-energy alpha particle hits an atomic nucleus, it smashes it apart to a greater or lesser extent, knocking off various kinds of fragments. Scientists then analyse the natures of these fragments by observing the directions, lengths and curvatures of the ionization trails the fragments leave in a cloud chamber. Thus they determine a fragment's mass, charge and perhaps other parameters, together with those of the products of subsequent decays of the fragments. From this in­formation, scientists deduce the nature of the components of the atomic nucleus. But fragments are not necessarily components. The atomic nucleus cannot be a structured conglomeration of conjoined sub-atomic particles the way it is often depic­ted in text books, like the example for carbon shown on the left. It is not like a cluster of billiard balls. If it were, there would be no way of arranging the protons and neutrons in any compact geometrical configuration without at least some adjacent protons touching. I imagine that, in this situa­tion, they would repel each other with extreme violence, causing the whole nucleus to explode instantly. Current scientific thinking views the atomic nucleus as more like a fuzzy jellical object, which is ostensibly spherical but of­ten deforms towards an ellipsoidal or even a pear shape. This gives me the impression of a homogeneous internal consistency rather than a 3-dimensional scaffolding network of sub-atomic components. I prefer to think of the frag­ments, that result from bombardments, as discrete quant­ities of æthereal substance rather than as expulsed comp­onents. I imagine the nucleus to comprise an integral quantity of positive æther diluted by an equal or greater integral quantity of neutral æther, all held together in some kind of standing wave framework. I see a blown-off fragment as a discrete amount of this essence, which, once free of the nucleus, reconfigures itself as a stable or metastable (transitory) entity according to the physical laws of æthereal dynamics. My quest, in this series of essays, is an attempt to make sense of - to get a handle on - the universe within which I, as a conscious being, perceive myself to exist. In this essay I have tried to gain an understanding of, what is to me, the most obvious features of the universe: namely, objects and what they are made of. But I can only describe my notion of objects. I cannot describe the reality of what they are. I can only ever describe my perception of what they are. My notion of objects does, I think, correspond well with the views of mainstream sci­ence. At least, up to the point where I mentioned my problem with force-fields. I understand that force-fields are [still] a mainstay of mainstream science. But at that point, I went galloping way off the mainstream track. Notwithstanding, my æther flow model of the subatomic world, although it differs from the mainstream view, is not altogether implausible. It is a framework of perception which, for the most part, fits observation and gives me a handle by which to understand the environment in which I exist. Of course, it can only do this down to a certain resolution of detail. It gives, by com­parison with current mainstream research, only a relatively fuzzy picture. But then, in comparison with objective reality, so does current mainstream research. Besides, I wager that my æther flow model could - with a little mathematical creativity - be adapted, extended and shoe-horned to fit most currently established observations. My point here is that mainstream science all too often thinks it has a rigorously ob­jective view of reality. But it doesn't. All its observations and deductions are plagued by the fallibility of perception from which no human observer can escape.